Amblyopia, commonly known as lazy eye, occurs when there is a lack of vision in one eye because the eye and the brain are not working together. The brain may start to ignore the image from the amblyopic eye. 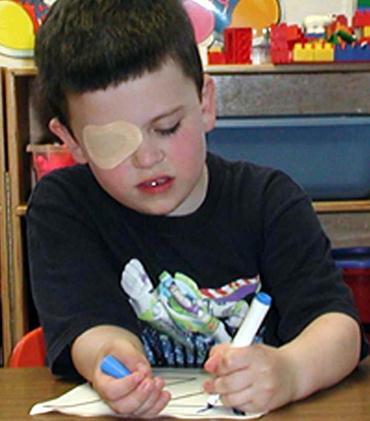 Amblyopia normally only affects one eye - resulting in the amblyopic eye pointing away from the other appearing "lazy". It is often associated with strabismus, or crossed eyes, when an individual’s eyes appear directed toward two different points instead of one. Lazy may result from a strabismus (crossed-eyes), difference in shortsightedness or longsightedness between eyes, as well as other pre-existing eye conditions, such as cataracts, ptosis (drooping of the upper eyelid), and refractive problems. Generally, when the eyes are not working together sending identical images to the brain. In cases of crossed eyes, there is one eye that is off-focus from the object the person is trying to see. The brain’s natural tendency is to ignore the off-focus image, leaving the eye that produces it underused and weak. After time, this weakened eye may remain out of position, resulting in lazy eye. With early diagnosis and treatment, improved sight in a lazy eye can be accomplished. However, in the worst cases, an untreated eye can be left functionally blind.